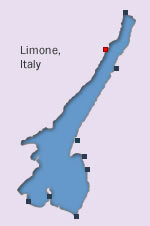 Limone is a small resort compared to most of the other popular destinations on Lake Garda. There are cliffs high above the resort and to either side and the settlement is located on the terrain which falls away fairly steeply from the main road around the lake. All of this makes it an attractive location, of course, with winding lanes and alleys which entice plenty of daytrippers from other resorts on lake. Many of the hotels in Limone sul Garda are located outside the central tourist area near the ferry embarkation point and are instead dotted along the shoreline or on the lanes above the resort and the main lakeside road above the town. Looking for some of the best-rated accommodation in Limone?